I already had one of Arda's long clips in dark brown, leftover from the hair I ordered for my Ceremonial Leia. And I just realized that I posted my pattern and accessory sources, but not pictures of the actual garment! Maybe I should post those before I start on my Senatorial Leia. . . . Anyway. . . I decided to use the two long clips for the buns after reading Kay-Dee's wonderful tutorial. 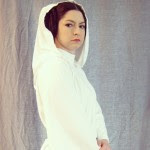 I was in part inspired to start this costume after reading about the origin's of Leia's hair. Even if it would PROBABLY be faster and easier to hand draw patterns, I still love putting them into Inkscape and making printable PDF patterns. 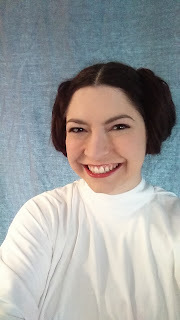 I'm indebted to the work from http://chucrew.com/Leia/dresspattern.html , Check her work out for assembly instructions! Use this link to get free shipping on your first Arda Purchase. Oh, and here are the finished bunz . . .